Love the color and freshness of annuals but don’t have any space outdoors? Don’t worry-many of them do just fine indoors! Here are the best ones and how to grow them. This is the time of year when people are out in their yards landscaping, planting vegetables and filling flower beds with explosions of color. Don’t have the space and feel left out? Don’t worry-a sunny windowsill is all that’s needed to enjoy colorful annuals indoors. Here’s a look at the ones best suited for indoor growing. Commonly known as Sweet Alyssum, this annual, a member of the mustard family, is delicate and fragrant. The tiny flowers come in white, lavender, pink, and dark purple. It’s popular as a bedding and groundcover plant because while it only grows a few inches high, if left alone it will spread up to a foott in all directions. To grow, pot up and place in a sunny to partially shady windowsill. It prefers cooler temps so keep away from heat sources and protect it from the hot midday sun with a curtain or light shade. This annual is prized more for its foliage than for its flowers. It comes in a variety of colors from bright neon shades to more subdued earthy tones. Cuttings root easily and it will grow happily in a sunny window but the colors will really pop if kept in more indirect light. To keep them bushy pinch off the flower spikes as soon as they appear. The small flowers aren’t very impressive and if left on the plant will get leggy very quickly. This annual is actually a Pelargonium rather than a member of the true Geranium family. 3 varieties do well indoors, the Zonal, Ivy and Scented. The Zonal variety is the most popular and the hardiest. They all do well in a sunny window and the Zonal and Ivy types will actually flower continuously all through winter if allowed. The Scented variety comes in a wide range of scents ranging from the wildly popular Rose to the delightful Pine scented and everything in between. The Ivy variety has ivy shaped leaves and a trailing habit and does well in hanging baskets or planters. These are one of the most popular bedding plants around but they also do well inside, especially the New Guinea variety. They do take a little extra work as they must be pinched back regularly to avoid becoming leggy. They prefer partial sun at most and moist soil. The Angel Wing varieties have been long prized for their showy foliage, but the common Wax begonia makes a lovely houseplant as well. They do well in any bright sunny spot but will also thrive in areas that get partial shade or indirect light. Should outdoor space become available, all of these plants will easily transition to outdoor life again! 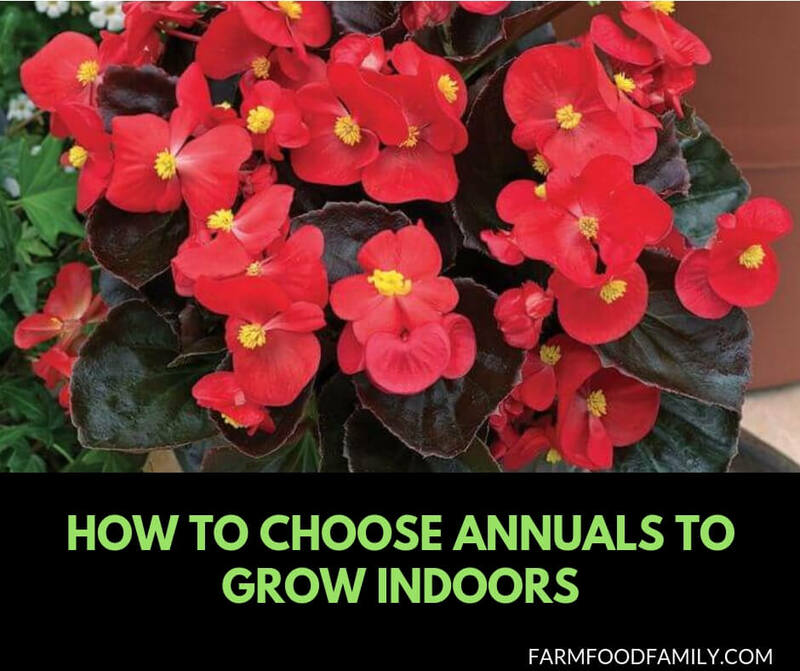 If you have experience growing annuals indoors, please leave a comment and share with us!